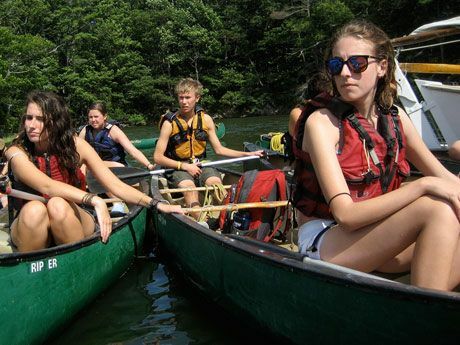 Trailhead and the Bronte Creek Project are semester-long community and environmental leadership programs for grade 10-12 students in the Halton Public and Catholic Boards in Ontario, Canada. Outdoor and experiential lessons guide students to become leaders who are balanced physically, emotionally, and academically. There's something magical about starting the school week outdoors. For adolescents who are still waking up from the weekend, a group game outdoors or a short story hike can be just what they need to get them going in the morning. At Trailhead and the Bronte Creek Project, starting class outdoors is something that we teachers strive for. I guarantee that it's more engaging than deskwork, and it's definitely more likely to get the students' blood flowing than opening a textbook. While our program is lucky enough to have access to many acres of outdoor field and forest space, not all schools are. Many teachers work at schools located in the heart of the city, so it's important to remember that you don't need a forest to reap the benefits of the outdoors with your students. I've been a part of Take Me Outside Day -- a Canadian initiative focused on getting students outside for part of their academic day -- at a very urban high school in Toronto, Ontario, and it really was amazing to see educators from all subject areas using the outdoors to help convey their content. Maybe one day outdoors each semester is all that you're up for, and hey, that's a good place to start. For educators that want to expand the walls of their classrooms a little more, check out some of the projects and activities that create experiential, outdoor opportunities for the students in our health and physical education classes and our English classes. Snowshoeing in the Winter: It's awesome if your school is lucky enough to have its own class set of snowshoes, but if not, consider seeking out local "outers clubs," sports equipment rental stores, or conservation authorities to rent them for the day. If you have time and funding, make it a field trip, and get out to a natural space for a fantastic winter workout. Sit-Spots: Part of our health and physical education curriculum focuses on mental health. 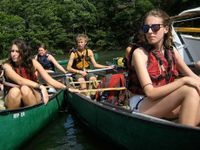 Having students learn to unplug, de-stress, and calm down is hugely valuable in creating mental stability, and the outdoors is a perfect place in which to hone these skills. Take students outside and have them sit or lie in a space that's just theirs (no cell phones, music, etc.). They might have a journal and a pencil, or they might just have 15 minutes to disconnect from their busy worlds. Either way, sit-spots are magical, and they can be done almost anywhere. Outdoor Poetry: Taking students on a hike to collect phrases and words that describe the season and place is an active way to teach strong diction, and students can use their collected observations to form haiku poems afterwards. Storytelling Improvisation: Wander around an outdoor space with your students. Have them find an object (leaf, rock, marking in the ground, etc. ), and then allow them to build a one-minute story around it. This is great for teaching voice, pacing, and creative improvisation. Children’s Festivals: As teachers, we actively seek out educational festivals and events for our students to participate in. We've partnered with our local conservation authority, and each year our students learn, practice, and teach workshops to younger students at the Halton Forest Festival. These are experiential, outdoor projects where our students develop their presentation skills in an authentic way. Earthkeepers: Our students also lead full-day, experiential Earthkeepers ecology programs for grade four and five students. Visiting youngsters are guided through the forest for a day of learning about its magic, and our students gain first-hand leadership, adaptability, and group management experience. This program earns our students marks in every one of their courses. Teachers are busy people, and outdoor, experiential classes can take more time to organize and facilitate than indoor learning. That being said, the benefits make it worth the effort. Regular outdoor activity allows my students to be more focused on their indoor work, as they can burn off energy in positive, productive ways. It also allows students to form bonds with each other and with the planet. For me, these relationships alone make it worth the effort. Use the Space That You Have: Find ways to incorporate your school grounds into your classroom content. It's the easiest step to take. Seek Out Grants: Your school may be eligible for outdoor education funding. If so, find out how to use it for buying some key equipment or taking your students somewhere amazing for the day (or week). I've also had success with private grants that have allowed me to take my students to organic farms (curriculum connections galore! ), and on some amazing hikes. Partner with Local Organizations: Connect with conservation authorities and outdoor organizations. They might have outdoor learning opportunities for your students. If you had to sit down and write out the top five most inspiring places you'd ever visited, I bet "the classroom" wouldn't be one of them. Create some memorable outdoor learning experiences for your students, and you'll be rewarded, too.